The Festival will be launched on Saturday 23rd of April at 5 pm in Roundy’s Bar, Tralee by Arthur Spring and Jimmy Deenihan. We would love to see as many people there to support the festival, enjoy a cuppa and celebrate the simple joy of the bicycle. There is a link for each festival event above and a full overview of the programme is available by clicking the PROGRAMME button to the left. Here’s a little snippet from our brochure below which will be distributed early next week. … that outside of Dublin and Galway, Tralee has the highest percentage of commuter cyclists in the country. Not only is it safe, healthy, and sustainable, but it’s also great fun, and that’s why the Kerry Bicycle Festival came about. 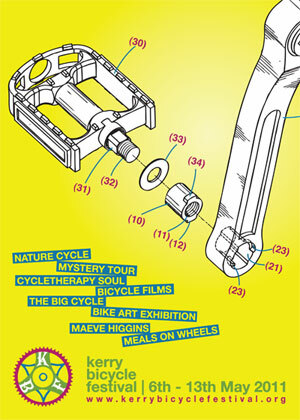 Come along to the Kerry Bicycle Festival launch and exhibition at 6.30 pm, Friday, May 6th at Siamsa Tire and take a peek at what’s going on. We would also love to see cyclists of all ages and abilities saddle up for the BIG CYCLE on Saturday, May 7th at 3 pm. Tralee has the potential to become a more cycle-friendly town. To find out more or get involved, come along to the Transition Town Cycle Advocacy talk at the Carlton Hotel on Thursday the 28th April at 8pm.